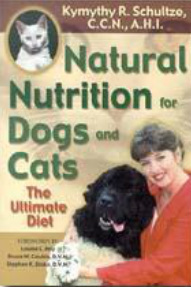 In these pages, Kymythy Schultze has provided an excellent nutritional text to help us build a healthier life for our animal friends. She has been a trailblazer in the field of animal nutrition for over a decade. Her professional experience with animals includes being a trainer, a breeder, a groomer, a veterinary assistant for multiple doctors, and a wildlife rehabilitator licensed with the federal government. Kymythy is a certified Animal Health Instructor and Clinical Nutritionist. Her nutritional recommendations are endorsed by both holistic and allopathic veterinarians.